The management at Dimples Crèche are proud to be part of the community in Sandyford for six years. Over the past six years Dimples Crèche has grown from supervising two children to currently caring for up to 170 children. We have also seen our staff number increase to 30. We are now delighted to announce our proposed development plan which is very exciting for Dimples Crèche. The new development plan (subject to planning permission) will involve the expansion of the crèche facilities and this investment is in the region of €200,000. An extra 300 sq m space will allow for 60 new after school places, eight new jobs, and additional facilities in a new building. This builds on the €400,000 that has been spent in development of the business over the past six years (which included the new car park). 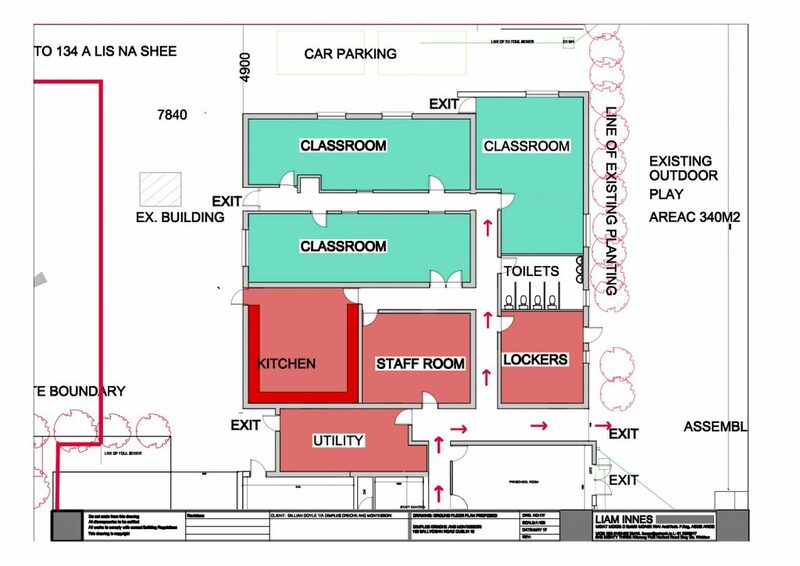 This development plan is due to commence shortly and will involve the temporary closure of the kitchen for an indefinite period of time at the end of June 2017. While the kitchen is closed the meals at the crèche will be provided by Little Dinners. This will ensure that healthy, balanced and delicious meals will continue to be served at the crèche. Little Dinners has been providing balanced and nutritious children’s meals to many of the country’s most prestigious childcare providers for the last 17 years. We have always strived to maintain the highest standards which are our number one priority for the future and these developments will only enhance Dimples Crèche. Please click on the image above to se a larger version, or download a PDF of the plans HERE. We celebrate six years in business this September and we are looking forward to coming years! Gillian Doyle is the co-owner of Dimples Crèche which she founded six years ago with her husband Jason. Prior to setting up Dimples, Gillian worked for the renowned Jones Group in Clonskeagh for five years before joining engineering company CSL as an office administrator before being promoted to office management. It was after the birth of her first child in 2005 that the seeds were first planted for establishing her own crèche. Feeling that her three children were missing out on the camaraderie of their peers and would benefit greatly from the social aspect of crèche life, Gillian along with her husband Jason, established Dimples, a childcare facility where they placed their own children. Gillian studied at the I.A.T.I. Institute of Accounting Technicians. She also studied Occupational First Aid, Paediatric First Aid, has a Level 2 Award in Food Safety and is Child Protection Awareness trained. Jason Doyle is the co-owner of Dimples Crèche along with his wife Gillian. Prior to setting up Dimples Crèche, Jason served an apprenticeship as a Stone Mason and with a strong background in art, he was later recruited to train as a sculptor. After ten years in sculpture Jason was chosen to work on high end projects such as Radisson Hotel and Áras an Uachtaráin. He was also enlisted to repair and recreate many of the pieces in Powerscourt Gardens. Jason’s business consisted of high quality projects from consulting, designing, creating Adams Antique Fireplace, Marble Bathrooms and Foyers. Six years ago Jason commenced a new project alongside his wife Gillian and over time has built Dimples Crèche from the ground up.